Vitamin D, which is really more like a hormone than a vitamin, is essential for healthy bones and strong muscles. It helps put calcium into the bones rather than into the arteries, where it causes hardening of the arteries. It plays an important role in metabolism, prevents infections, enhances mood, and reduces the risk of cancer and auto-immune and cardiovascular diseases. Rickets, osteoarthritis, osteoporosis, and fractures are a few of the many problems linked to low vitamin D.
Our primary source for Vitamin D is sunlight. The skin of mammals contains cholecalciferol, which is converted to vitamin D3 when exposed to ultraviolet B (UVB) light. D3 is better absorbed and utilized by the body than D2 and it remains useable for weeks instead of just days. Many things affect our ability to get adequate D from the sun, including where we live, how much time we spend outdoors, and how much skin we expose. Being older and having darker skin reduces the amount our bodies can produce, but perhaps the biggest factor contributing to our modern epidemic of vitamin D related conditions is the increased use of sunscreens. The American Cancer Society says, “Ideally, about 1 ounce of sunscreen (about a shot glass or palmful) should be used to cover the arms, legs, neck, and face of the average adult,” and that it needs to be reapplied at least every two hours. The Skin Cancer Foundation recommends using sunscreen every day, even when indoors (http://www.skincancer.org/prevention), lest, God forbid, reflected light from a window might strike your unprotected skin! At the recommended rate, each person would go through a whole bottle every day or so. For more in-depth information on vitamin D and sensible sun exposure, check out the Vitamin D Council (http://www.vitamindcouncil.org/) They advise that we avoid the use of sunscreen altogether and that we should cover up with clothing or move into the shade after getting a little sun. The second way to get vitamin D is from supplements. Sun-phobia and aggressive marketing by the manufacturers of sun protection products have undoubtedly made alternative sources for vitamin D a necessity for most people, but that is not a viable solution for some of us. Nearly all commercial vitamins and supplements get their vitamin D3 from lanolin (the oil from sheep’s wool) even though they may not tell you that on the label. That makes them off limits for those following plant-based diets and even for me. I’m not a vegan, but I am allergic to lanolin. A one-ounce bottle of lichen-sourced D3 (https://www.nordicnaturals.com/en/Products/Product_Details/514/?ProdID=1673) has a list price of $21.95. At my dose of 5,000 IUs per day, it lasts me two weeks. A second vegan D3, made from several varieties of mushrooms, costs around $15 and would last me a month. (https://www.amazon.com/Natures-Plus-Vitamin-Vegetarian-Capsules/dp/B0042DDP44). Thankfully, I’m not allergic to mushrooms, but it contains 23 “other ingredients,” including several things that I can’t take. The third source for vitamin D is food, but it is almost impossible to get enough from food alone. Animal foods, such as liver, fatty fish, and egg yolks provide some D. (Cod liver oil contains vitamin D3, however, it is high in vitamin A, which can be harmful if it builds up in stored fat). Fat-soluble vitamins like A, D, E, and K can only be absorbed if there is sufficient fat in the diet. Much of our food supply has been stripped of natural fat and plant-based diets are being heavily promoted as the most beneficial for health; vegetarians and vegans are especially at risk for vitamin deficiencies. Mushrooms are the exception to the rule that you can’t get vitamin D from plants. Fungi contain the plant sterol, ergosterol, which is converted to vitamin D2 (ergocalciferol) by UVB light in a process similar to the way 7-dehydrocholesterol in human skin is converted to D3 (cholecalciferol). Fungi are the only option for vitamin D from non-animal sources but they don’t naturally contain very much. However, when mushrooms are exposed to UVB light, their D level skyrockets. A study from Boston University School of Medicine found that mushrooms have the capacity to produce not only D2, but also D3 and D4 if you know the tweak! During the three summer months (or any time if you live in the tropics), buy fresh mushrooms, shitaki or portabella preferred. Remove and discard the stems or use to flavor broth because they are too tough to eat. Place mushrooms gill-side-up on a tray and set outside in direct sunlight during the middle of the day for six hours per day on two consecutive days. Cover or bring them inside at night so they don’t get damp. 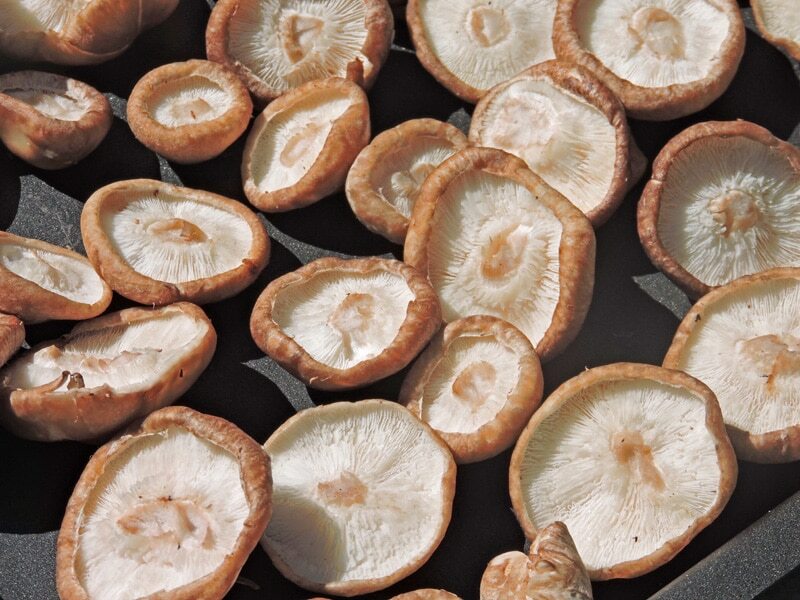 If mushrooms are not completely dry after two days, place them in a warm oven or dehydrator to finish drying. Store air-tight and use within a year. Just one-tenth of a light-treated portabella mushroom can provide a full day’s supply of vitamin D, so use your treated mushrooms sparingly to get maximum use. They can be mixed with any dried or fresh mushrooms for use in cooking. The only way to know for sure that my super-mushrooms are giving me enough vitamin D is to try them for a while and then get a 25(OH)D serum blood test. Cover dried mushrooms with hot water. Soak for 30 minutes or until softened. Set a mesh strainer lined with a double layer of cheesecloth or a coffee filter over a bowl. Place mushrooms with soaking liquid into the strainer and let the liquid drain into the bowl. Reserve soaking liquid to use as broth. Remove the filter from the strainer and rinse mushrooms to remove debris. Place mushrooms on paper towels and blot dry. If using fresh shitakis or portabellas, cut off stems or pinch them out with your thumbnail and discard or use to make broth. Stems of other mushrooms can be eaten. (The dried mushrooms that were exposed to the sun will already have the stems removed.) Rinse mushrooms quickly under cold water. 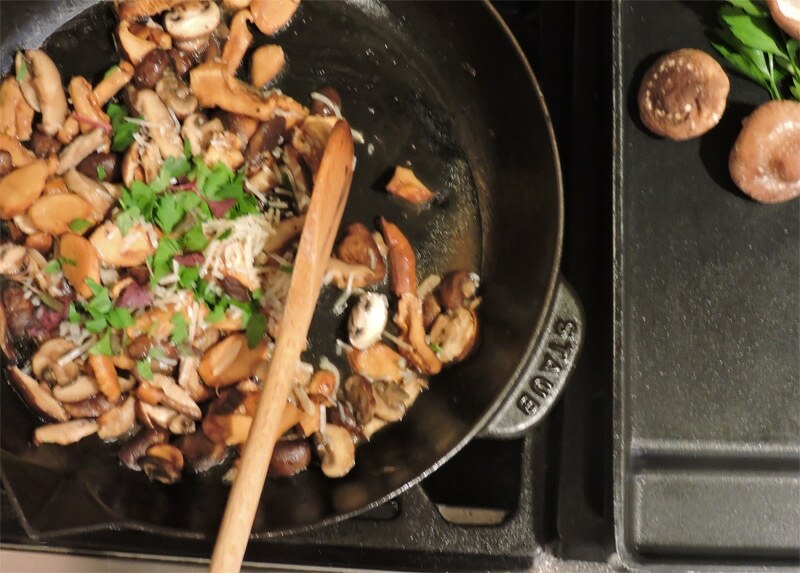 Slice both fresh and rehydrated mushrooms. Heat fat in a medium skillet. Add garlic and mushrooms and sauté for 2 to 3 minutes or until garlic is softened. Add soaking liquid from mushrooms or broth to skillet and heat until steaming. Cover and steam for 3 minutes. Remove cover and continue to cook for 4 minutes longer or until liquid is absorbed. Sprinkle herbs over mushrooms and top with cheese to serve as a side dish or stir mushrooms into sauces, soups, or stir-fries. *One pound (450 grams) of fresh mushrooms will weigh about 2½ to 3 ounces (70 to 85 grams) after drying. Even five minutes of sun can increase the vitamin D content in mushrooms substantially! Indoor ultraviolet lamps are actually even more effective for increasing vitamin D than natural sunlight. Slicing the mushrooms before drying will expose more area to the light and increase the vitamin D content. Dried mushrooms can be ground into a powder and used to flavor, thicken, and enrich soups and sauces or put into capsules to use as supplements. This article first appeared in the Novemver issue of Low Carb Direct Magazine. DIY vitamin D3, Dried mushrooms, Vitamin D3 from mushrooms. Bookmark.